Kevin Labanc scored 3:21 into overtime as the host San Jose Sharks moved into first place in the Pacific Division with a 3-2 victory over the St. Louis Blues on Saturday. 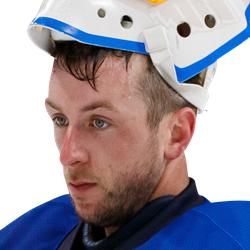 St. Louis goaltender Jake Allen kept the contest tied at 2 by using his blocker to deny Marcus Sorensen's bid on a breakaway with three minutes remaining in the third period. 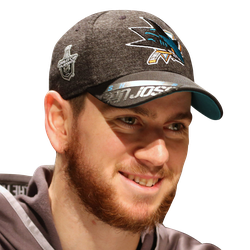 Allen also turned away Gustav Nyquist's shot from the slot early in overtime before Labanc converted a give-and-go with Logan Couture for his fourth career overtime goal. Timo Meier scored twice to extend his goal-scoring streak to four consecutive contests for the Sharks (41-19-8, 90 points), who completed a sweep of their four-game homestand and moved past idle Calgary atop the Pacific. Joe Thornton notched an assist on Meier's first goal for his 1,467th career point, tying Hall of Famer Stan Mikita for 14th place in NHL history. Goaltender Martin Jones needed just 17 saves. St. Louis native Patrick Maroon and Brayden Schenn each scored a power-play goal, and Allen finished with 30 saves for the Blues, who wrapped up their three-game trek through California with a 2-0-1 mark. St. Louis (36-25-7, 79 points) played without leading goal scorer Vladimir Tarasenko, who sustained an upper-body injury on Thursday in a 4-0 win over Los Angeles. After Maroon converted a fortunate carom off the end boards past Jones to open the scoring at 10:35 of the first, Meier recorded his sixth career two-goal performance by tallying twice in a span of 3:10 to give the Sharks a 2-1 advantage. Thornton set up the power-play goal with a feed from behind the goal line to Meier, who wristed a shot from the slot that slid between the pads of Allen with 3:37 remaining in the first period. Meier added his fifth goal in four games and 26th of the season by sending a backhand shot just inside the right post from the doorstep with 27 seconds left in the session. Schenn forged a tie at 2 after his attempted feed across the slot was intercepted by San Jose's Barclay Goodrow, as the Blues forward alertly swept the puck off his stick and past Jones with three seconds remaining in the second period.